we lazybirds have taken on a new project and we’re really excited about it. we partnered up with mercy street and started a baking club! i’ve been working with mercy street, in west dallas, for about two years now…so, when i started to think about how lazybird could bake with more purpose (other than simply fattening up our coworkers), it quickly dawned on me where i would love to be. lets talk about west dallas…. west dallas is about a 15 minute drive from my apartment in north dallas. it is the 11th poorest community in the nation. per capita income: $8,912 / year. number of DISD students in 2009 scoring “college ready” on standardized test: 5%. number of college graduates from west dallas DISD schools: 2%. when you consider that highland park, one of the city’s most affluent neighborhoods, is literally 6 miles up the street, it’s obvious that west dallas is a community that has been pushed out and left behind. to be honest, it’s the kind of neighborhood you might drive through and immediately feel uncomfortable – lock your doors, try not to make eye contact, and pray for no red lights to hold you up. it’s the kind of neighborhood that brings judgment bubbling to the surface as well as pride and superiority. mercy street is a non profit organization that settled in west dallas in 2003 with a goal of revitalizing a community through gospel centered love. led by founder trey hill, the mercy street staff uprooted their lives to be planted in west dallas…serving the community by living in, loving on and encouraging the community. as west dallas has fallen into a cycle of generation poverty and hope has diminished, mercy street moved in with a goal of raising up a new generation of leaders…to restore hope and dreams where they were lost, all in the Lords name and glory. mercy street’s staff live amongst those they serve and have become apart of day-to-day life. they inspire, they teach and they deeply love this community. the heart behind mercy street has been such a beautiful thing for me to witness and to be apart of. it has changed my life, my perspectives, my priorities and my prayers dramatically. oh, how my previous judgement was transformed into compassion when i took the time to look into the lives and the history of this community. pride and superiority were replaced with deep affection, mercy and love…the first time my sweet mentee wrapped her arms around me. the people of west dallas are not so different from you and me. they are broken – just like you and me, they turn to unfulfilling and destructive habits – just like you and me, they are hurting – just like you and me and they thrive when they are cared for, encouraged and loved – just like you and me. externally, things might look different…circumstances and environment might be worlds apart….but internally…at our core…we are all the same. i believe our hearts are inclined to love our neighbors….it’s just that sometimes it’s not revealed to us until we actually take action and open the door to our neighbor. once we take the time to get to know our neighbor on a deeper level, it’s hard to turn our backs on them. while mentors are mercy street’s primary outreach, they have also reached the community through tutoring, sports, dance clubs, bike co-ops, gardening, bible studies, etc. etc. etc….so why not a baking club as well? my vision for volunteering at mercy street began as a prayer for direction in service. i was seeking out a place to serve and wanted to be intentional in using the skills God has gifted me with. i wasn’t even considering my passion for baking as a “skill”…and then one day it just dawned on me – maybe God blessed me with this passion…so that i could share it with someone else. 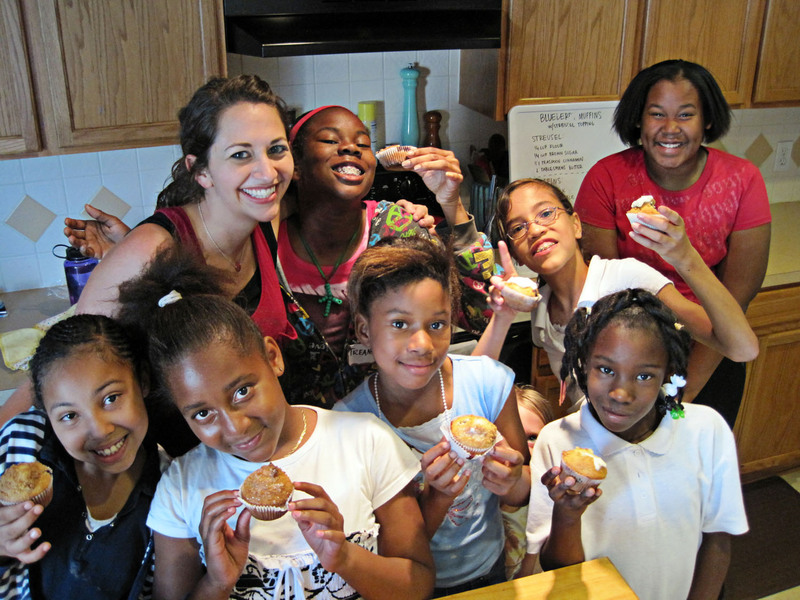 i have such fond memories of learning how to bake with my mom as a girl….that it occurred to me that a baking club could be such a blessing and joy to the young girls of west dallas. i quickly contacted mercy street about starting up a baking club and was overwhelmed by the way God had been moving their hearts towards the same vision. our hope is to inspire some bakers in west dallas. we hope to provide a creative outlet and foster skills and talent that could even lead to a career. but more than all that, our hope is to build relationships and pour out love and support on these children, for Gods glory. ‘little birds’ means posts on simple recipes…we’re talking quick, under an hour, a fourth grader can do it….you have no more excuses – simple recipes. i hope you enjoy this adventure! there are many ways to serve west dallas, either specifically through mercy street or through a number of organizations that can be found here. serving at mercy street has been such a blessing and has had such a huge impact on my life. if you live in dallas, i would absolutely encourage you to pray about ways you could serve west dallas. if you don’t live in dallas, i would encourage you to look around your own community. i believe that we are all placed exactly where we are with a God-given purpose. there are people in our own backyards who need to be reached, and served, and loved. as i’ve learned with baking, if it’s something you love and have a passion for…it doesn’t feel like a burden or chore….it might even become your favorite part of the week. Well said. I’m sure you’ve already made a difference for those girls. Great post. I am loving what the Lord has done to put you in the right place, give you passion, and keep pushing you forward. I am so proud of you. It’s a constant encouragement to watch your faithfulness and see the Lord’s hand at work through you. I also am very proud of you and how you are allowing the Lord to use you. I can tell from the big grins on your little cook’s faces that they are truly enjoying their cooking experiences. Can I ever imagine the chaotic situations and the patience that the Lord has blessed you with!! !Here’s to more finger lickin cooking products. I am so thankful and proud to call you my friend. You are truly inspiring. What a great testimony and challenge to us all of seeing God moving everywhere He places us – and in everything He gives us to enjoy! Now, cue the Mr. Roger’s song – We’re proud of you, we’re proud of you… But, more than that, I know that God is singing of you with joy, Laura! Thank y’all for all the encouragement! I’m excited to see what God has in store.